Detailing the physical features, habits, territorial reach and other identifying qualities of the Clay-Colored Billbug. Two-toned Clay-colored Billbugs have a nose for young corn plants, but cattails will do just fine. 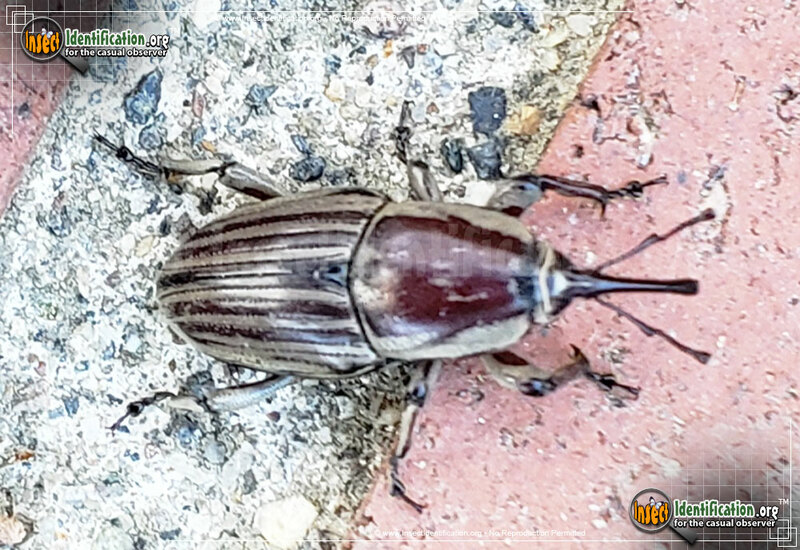 The Clay-colored Billbug is a type of beetle in the Weevil family. The long, duck-like snout and elbow-jointed antennae are commonly seen in many Weevil species. This particular species is a dark brown to auburn color with tan stripes on the abdomen as well as the pronotum. They feed on bulrushes and reeds, typically found in wet natural areas. If corn fields are nearby, they will also feed on the stems of young corn plants, making them an agricultural pest across the continent. Jaws at the end of the long snout enable the Billbug to eat inner plant tissue. While their feeding activity may not kill the young plant, it can damage it enough to stunt growth and reduce the size of the ears of corn produced. Crop rotation, early planting, and decoy plants are helpful strategies used to minimize impact.